Module 4 of The School for Change Agents saw participants receive a masterclass from Kathryn Perera on mobilising and organising our communities to effect positive change. 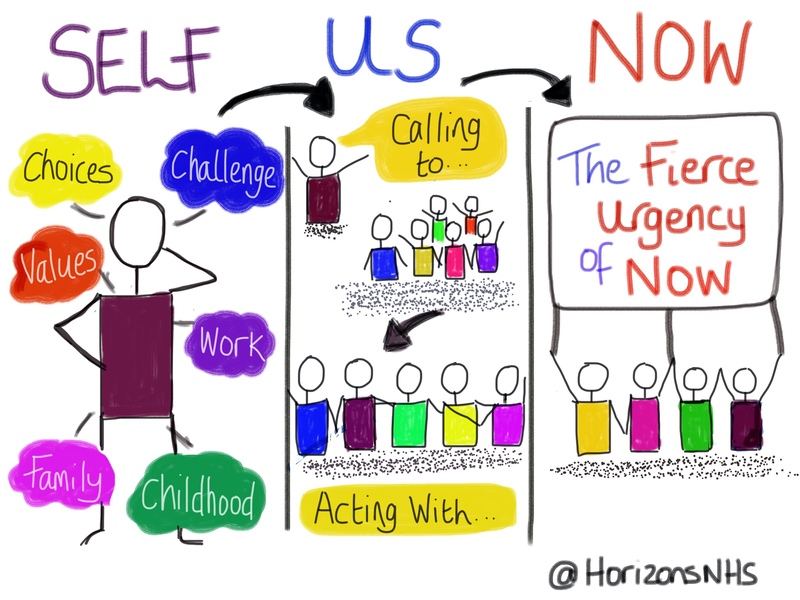 The sketchnote above shows the main components of establishing a social movement: Self - Now - Us. So, you have identified something you would like to change. You have built your sense of personal agency, and you understand that you can do it! You've also identified that you need to work with others to help you achieve your change. By building your personal narrative - your story. Too often in our working culture the impetus for instigating change is provided in the form of numbers and graphs. Data might tell us we need to do something differently, but what it doesn't tell us is why - the story behind the data. Your idea could be something as simple as asking healthcare workers to introduce themselves to patients, as the late Dr Kate Granger identified from her own personal experience of being told her cancer was terminal. The doctor didn't introduce himself, nor did they make eye contact. They conveyed the news, and left Kate to process it. This awful experience became the #hellomynameis campaign, and is now helping transform communication and conversations in health and care across the whole world. "Stories not only teach us how to act – they inspire us to act. "Stories communicate our values through the language of the heart, our emotions. "And it is what we feel – our hopes, our cares, our obligations – not simply what we know that can inspire us with the courage to act." How do you craft your own narrative and compel others to act? Self-Now-Us gives us a useful framework from which to start. Tell us about yourself: what matters to you, what do you care about, what are your values? What impact have your personal life and work experiences had on you? What is it you would like to change? Why? How will this change help other people? Hopefully this will encourage people to join with you and you can start working together as an Us (don't forget those other people can be from a diverse network). Together, you build your sense of urgency - why does this need to happen Now? Part of your narrative could include how things might get worse in the future if you don't act. 1. Beware the snare of preparation. Get to action. 2. Frame issues simply, in ways that will engage people’s imagination and energy. 3. Weave relational conversations into everyday work. All real life is meeting, not meetings. 4. Connect with your first follower – or become one for someone who inspires you. 5. It’s only a movement if it moves without you. You also need courage. Sharing your personal story with others, and allowing your story to become a part of the movement is a brave thing to do because it is no longer 'your' story. Connecting with your first follower takes guts - asking for help means showing vulnerability. Becoming someone else's first follower also takes courage - are you doing the right thing? Might you make a fool of yourself? As Kathryn explained during module 4, building a social movement is not an exact science. It's based on evidence, yet there are no set rules, and no guarantees of success. The way forward is to build relationships with others. Use your intuition. Be genuine and authentic. Craft a strong narrative. Be prepared to amend and flex as events occur and opportunities present themselves. Remember that you're likely to come up against resistance and reactance. Manage your expectations - Rome wasn't built in a day - and build your resilience. Most importantly of all? Remember your why. Connect and reconnect with your passion, and the pieces will fall in to place. And never forget that with hope, anything is possible. The last era of management was about how much performance we could extract from people. The next is about how much humanity we can inspire.